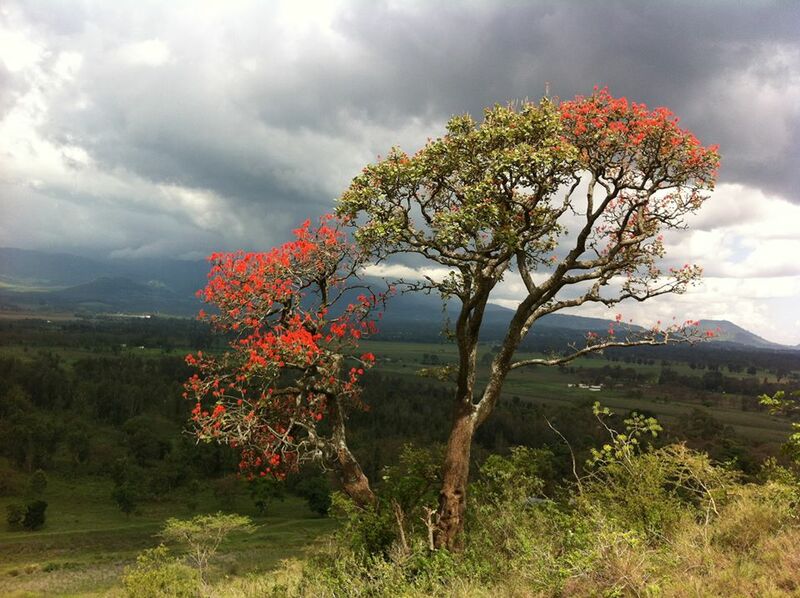 A native of the UK, James Wolstencroft now lives in Arusha, Tanzania. He guided his first East African safari in 1976 while he was a student at Cambridge; before that, his pursuit of birds had already taken him around Europe, across North America, through Russia, and to Turkey, Iran, Israel, Arabia, Nepal, and the Himalayas. 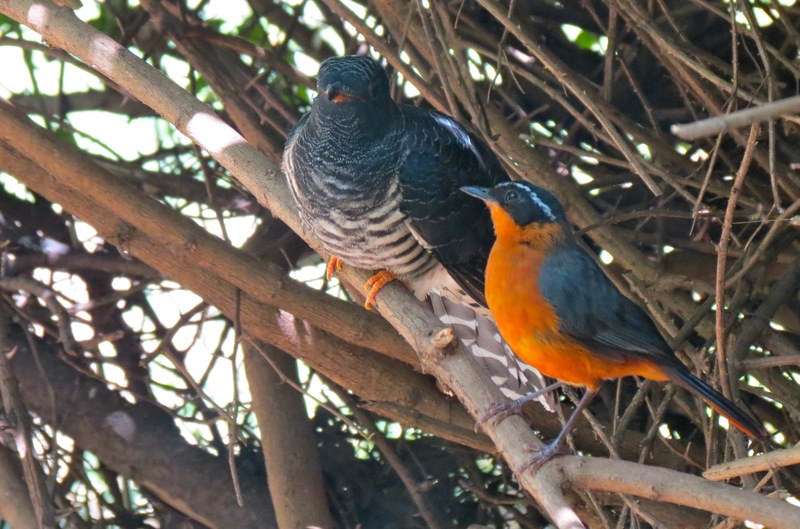 James’s love affair with the Oriental tropics really took off during longer periods in India and Indochina in the 1980s; he guided his first birding tour to Assam in 1988. During the 1990s James lived in Thailand, Ethiopia, in Lao PDR, and in the Seychelles, where he worked for ICBP/BirdLife. He has watched birds in fifty-nine countries, one country for each year! Three years in southern Spain preceded his move in 2005 to Tanzania, where he lives with his wife, Elsie, and their two teenage sons. James is a specialist bird guide and nature tutor. 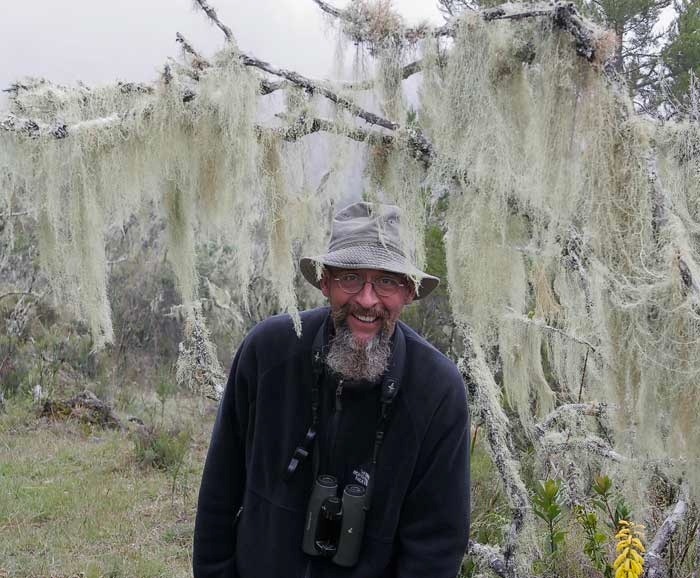 He arranges and guides tours for singles, couples and small groups lasting from a single day, such as a specialist add-on to a family safari: “Birding For Larks – Around Arusha”, to birding tours of a month’s duration. “Is a day with a great birder worth the same as an engineers time? Or a Lawyer’s? A Doctor’s? A Manager’s? As a long term tour operator (wildlife, not bird specific) I known the costs. I know that most small, genuine tour operators are excellent but under-valued and under-paid. What the birds in the garden have in their daily life, and which I don’t have in my daily life, actually becomes mine when I come to know what it is like to be what they are. Pretty plain, grey-brown of plumage, yet the long-winged “Spotted Fly” is graceful in the air. A delightful Eurasian passerine. Twenty-one years ago the status of the Spotted Flycatcher here was succinctly described in a fine volume on East African birds as: a widespread often common palearctic migrant October-April. In the northern winters of 2006-7 and 2007-8 a Spotted Flycatcher came to roost each night in a tangle of creepers outside my kitchen window. A window onto an equatorial wildlife garden on the slopes of Mount Meru in Tanzania. Each morning at daybreak this little bird would leave its safe haven to forage around the tiny fields that surrounded the garden. It would spend the day catching insects – doubtless both ‘good’ and ‘bad’ – within our neighbour’s shambas. A shamba is an East African small-holding. It thereby provided our neighbours (as Spotted Flycatchers have been wont to do) a useful service in pest control, snatching flies around their huts, and out over their little vegetable gardens. And every dusk it would come back to sleep at ours. It became my habit to share the last moments of daylight with this flycatcher. A comrade from Ulaya (Europe) until the bird disappeared into those creepers once darkness had ushered-in the night. Each evening in those two ‘winters’, I came to relish the tender, protective feelings I experienced as my bird returned, and as it disappeared into that tangle of lantana and bougainvillea which draped itself over the spindly juniper right outside our house. 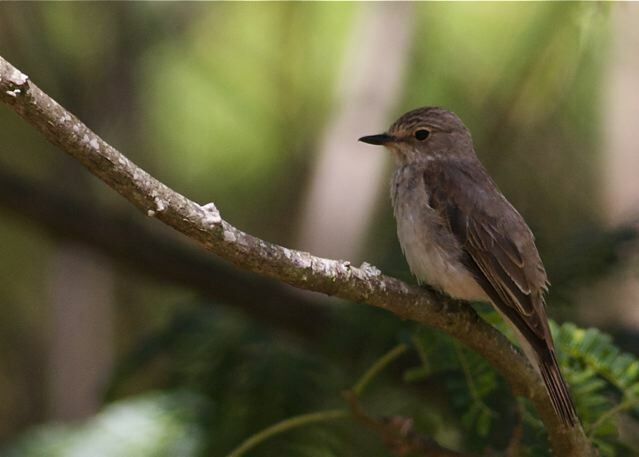 In November-December of 2009 our Spotted Flycatcher failed to return. In fact during the southward migration of 2009 we only once observed a Spotted Flycatcher in our garden. It failed to return, but from where? Well, most likely our bird was from a breeding site in Europe, or in European Russia. In those great lands far away ‘up-north‘ a flycatcher’s nest to be successful must, of course, be in a place rich in flying insects! So it would most likely be around an old-fashioned mixed farm or a somewhat dilapidated country house (or dacha) in a place where cattle are pretty much free to roam, where the owners remain conservative of habit, if not yet deliberately benign as our eco-friendly youth may yearn to be. Perhaps the nest would be in a well-timbered churchyard, or in the half-empty corner of a garden in an English country pub – one may here substitute French, Dutch, German, Swedish etc. Perhaps it would be in a rock cleft by a clear-flowing woodland stream, or along a sparkling highland river, one beloved by trout and salmon, overhung with old deciduous trees. And so on. You get the picture? Obviously I am a great admirer of the Spotted Flycatcher and their habits. No, let’s be honest, I love them! And moreover I love those exact places from which I remember them! And there are many. 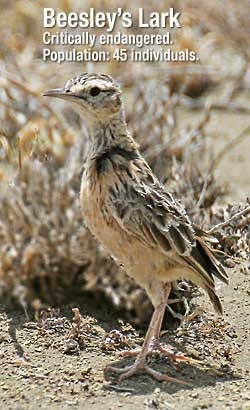 This small bird is, or rather used to be, a common summer visitor to my homeland. To an England that we’ve all but destroyed, trashed for financial profit, and likely even more ruthlessly than those defeated Nazis, Nips and Commies might have done. Increasingly thinking of this bird, now absent from my list of daily birds, conjures companionable memories of one young boy’s delight. A delight amid personal tragedy. Delight in nature’s power for renewal. In the joy of spring. The magnificence of May, our queen of months. Drifts of bluebells (wild hyacinth) and the intelligence of hazel, the folk-friendly understory of so many ancient woods. Of orange-tip butterflies scattered across a sunlit flood meadow on that first warm afternoon of spring. And, perhaps most of all, my memories of sultry summer scrambles along canal and river banks, and over arching bridges into the Wayside and Woodland of a Warwickshire countryside in a semi-secret early sixties youth. If only that Warwickshire countryside, which I so vividly recall, might one day restore itself to ecological wholesomeness. If not to those capitalistic conditions of agricultural enclosure that brought it into being. Perhaps. My youth of course is clearly gone, and I doubt I’ll live long enough to see for myself the bright buds of our ecological renaissance! Never mind, you can appreciate how I feel about this bird. About this species. For sure, for quite a few of us, this is an icon species, to use the green-speak of those career conservationists in whom we’ve placed our trust for the continued sanctuary of Nature. Without doubt the Spotted Flycatcher is an appropriate biodiversity indicator demonstrating something’s gone seriously wrong. Not just with our birds but with our appetites and our window on the world. Perhaps the surviving Spotted Flycatchers might like to know, and appreciate, that they have been the beneficiaries of a (British) biodiversity action plan, if not yet of any meaningful action! Even now, in December 2014, quite a few professional conservationists, in their homes and offices in Europe, speak as if they still believe the seeds of this bird’s demise lie down here, around the equator, in Africa’s darkness where so many uneducated peasants live short lives in damp mud (or cement) huts, scratching a meagre living from the Earth. Poor Africans who are unaware of the joys of the Consumer Christmas. Could they be the folk who are screwing-up the security of our homeland’s birds together with their own? Yet seriously, the decline of so many, possibly all, of Europe’s sub-Saharan migrant birds, the perfect canaries for a globalised mine mentality, demonstrates just how badly we’ve allowed ourselves to abuse the workings of Nature. Abused ever increasingly, as globalisation has expanded these past three hundred years. We’ve abused Nature by the limitations of our socio-economic system. One that, whilst constantly banging-on about freedom, demands a linear conformity of mind, achieved largely through the development of subtle propagandas, that have become increasingly effective no matter where in the world we may live. I think that contemplating the lives of these small birds can assist us to understand our own, and to act in ways that might transform this poisoned mine-and-mill set for good. No longer shall we pass the buck, whilst reconciling our conscience with the apparent inevitability of a chaotic suffocation of life. An extinction of diversity thanks largely to our anarchistic selfishness. A process that will otherwise continue to undermine Earth’s ecosystems as we spiral further down the commodification line. We must not allow our former diversity to be doomed by our lack of forethought and the reluctance to act outside the box, to accept a bit more risk. And to stand up for what we love. It is my romantic belief that people protect what they have come to trust, and love, far more than that which is only useful to them as a means of exchange – as money. Anyway, that’s enough rambling from me! I’ll leave it to the lives of others, sadly now departed, to speak a little on behalf of my beloved Spotted Flycatcher and hope that my sources are properly acknowledged. Number 4) Changes in agriculture. Firm data on the importance of this for spotted flycatcher are lacking, but there is growing evidence that a range of birds found on lowland farmland are affected by low invertebrate availability during the summer. We’re not sure. Trends. Downward. Drivers. Data. It could be this. It could be that. Long distance migration. More research needed. Data. Jobs. Funding. Money. Please donate now. And so forth, I’m sure you are all familiar with the infuriating procrastination of those who are bound to preserve the status quo whilst giving the public impression that whatever the issue of concern – “we‘re on it“. Except that they didn’t and it isn’t“.